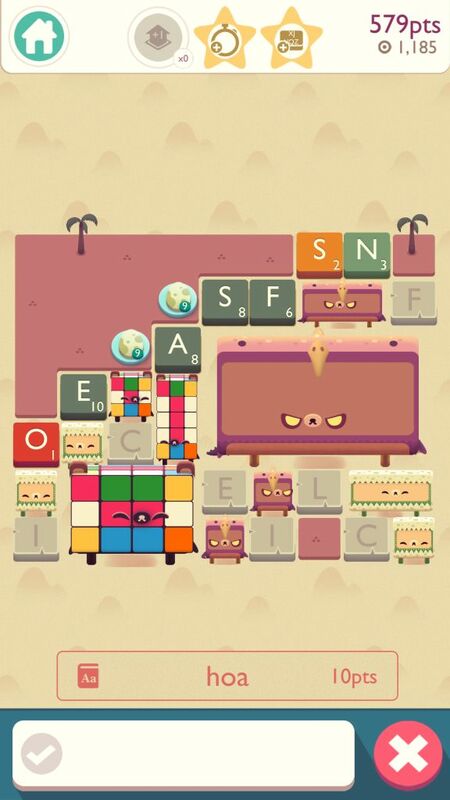 In a word puzzle game, there’s nothing more exhilarating and satisfying than discovering a word from a letter pile. 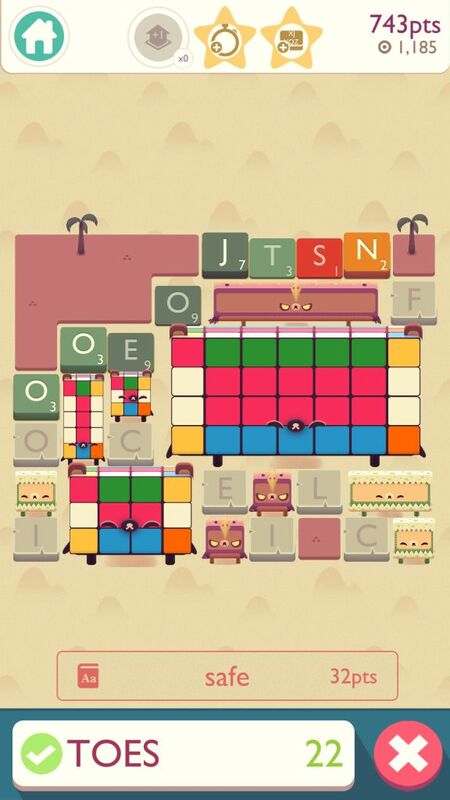 In Spryfox’s newest word puzzle game, it’s double the fun! With a new storyline, lots of collectible bears, fun game modes and events, Alphabear 2 is here to win the hearts of word puzzle fans. Not only will you create words from random letters on a game board, but use cute teddies and see them grow as you make new words. Gameplay is very similar to the first game, although the scoring system is a bit different (more on this later). You will have to spell words by tapping on tiles. As you discover and submit new words, you will see teddies grow. The biggest bear at the end of a level adds extra points to your total score. You can also get bonus points if you select certain bears that you have acquired on your time-traveling adventure. 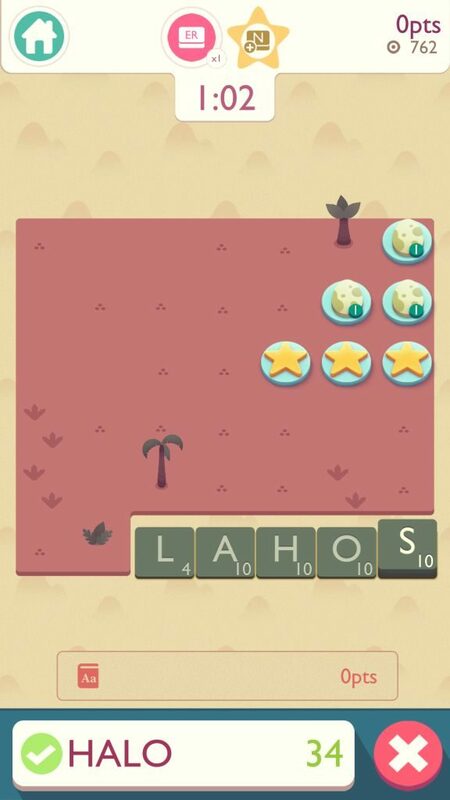 They power up your total score, some can even increase points if you use certain letters while creating words. Others provide “active” powers that set off when you tap their skill on the top of the game board. 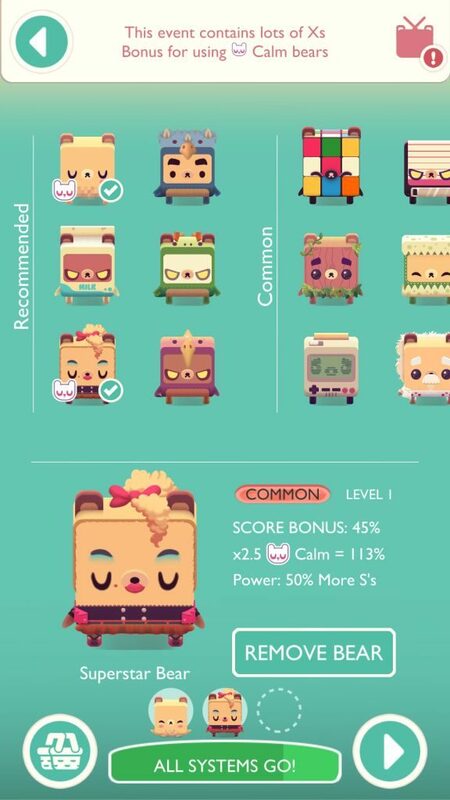 You can check each bear’s special powers by tapping the album on the lower-left corner of the screen. The game has a built-in dictionary that lets you know the meaning of a word you spelt while playing. There are also fun events, including repair-the-clock levels that reward coins, boosters, upgrades and clothes, which you can use to dress up teddies. I personally love those postcards that appear after winning a level. They generate random sentences using the words you spelt while playing. These sentences can be pretty hilarious, and sometimes pretty embarrassing so try not to read them aloud. You can share these colorful postcards with your friends via social networking sites. The points you get for spelling a word is actually the base score. Bonus points are added to the score, but it depends on a chosen bear’s score bonuses and mission bonuses (if any). Here it’s very important to know that the points displayed on the upper-right corner of the screen are final and no extra points are added when the game ends. The total score breakdown will be displayed on the screen when the game ends. It includes points earned by the biggest bear in a level. Before playing a level, check if there are any level bonuses. For example, you will get bonus points if you spell 2-letter words in level 1-5. The largest bear in any level boasts 4 bonus points per square. So if the biggest bear occupies 6 squares (3×2), the total big bear score would be 24 points (6×4). The score on the upper-right corner of the screen includes the points of the current biggest bear. 1. Select bears wisely. In most levels, the game will suggest selecting a certain type of bear to get multipliers. For example, in chapter 2-18, you will get x2.5 multiplier if you select calm bears. 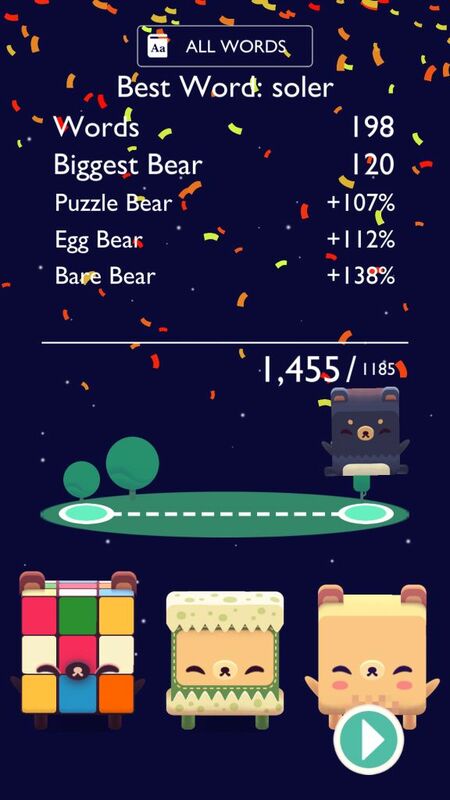 So if a calm bear has a score bonus of 45%, it will be multiplied by 2.5 giving a whopping 113% bonus to your score. Remember that you will have to reach a score target in every level before you run out of letters or time. If you have more bears of the same type, select all of them to give a huge boost to your score. 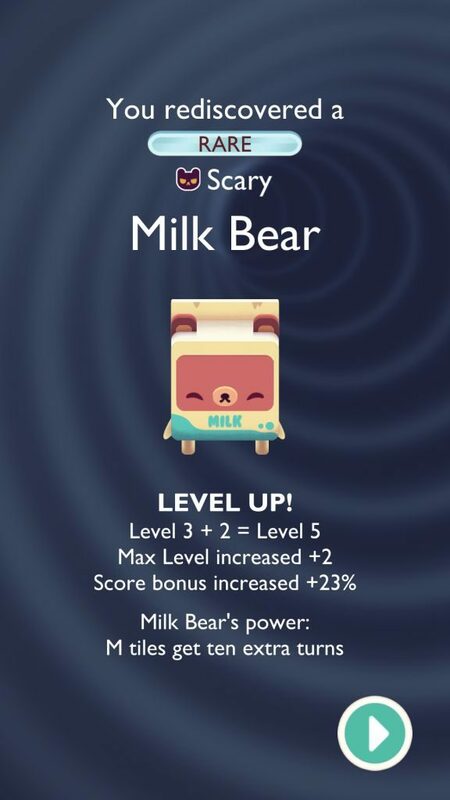 So if you have 2 calm bears, use them in a level that requires calm bears to get multipliers. You can choose up to 3 bears before a mission. Tip: To get additional points for the plural form, use Floppy Bear. He grants 5 bonus points to words that end with “S”. You can also look for past forms of a word and add “ED” to the end of a word to get more points. 4. Use a word solver to find 5 or 6 letter words quickly. There are lots of word solvers online and all you have to do is enter letters to discover new words. You can take the help of Wordsolver.net to quickly find long words and score more points in a mission. While I don’t encourage using word solvers, you can use one when you are having difficulty in finding words or the level is extremely hard to solve and only longer words can help you win it. I wouldn’t recommend getting help from word solvers in timed missions. You will be wasting a lot of time rearranging letters to find words. 5. Make sure letters do not turn into stones on the middle part of a game board. Stones appearing on the middle of the board will prevent a bear from growing. If there are red letter tiles, then use them with other tiles to spell words. In every turn, a letter tile’s number is reduced by 1 point, and a red letter tile suggests that it will expire soon and turn into a stone. Pay attention to those tiles that have turned red and use them to spell words. Remember, the bigger the bear, the more bear points you will earn. It’s very important to give more space to a bear by making sure there aren’t red tiles around him. 6. Upgrading bears gives a nice little boost to their score bonuses and other powers. You can level up a bear if you get his duplicate from time warps or go to “Bear School” to level up certain bears using honey. A bear requires 24 hours to be upgraded so you won’t be able to use him in any level for the entire day. Make sure you select bears wisely. Choose only those that you won’t be using in any mission for some time.